From a technical standpoint, this is a clear breakdown in the chart, as it eviscerates the potential bullish inverse head & shoulders that had been forming. But, the fundamental reasons causing the stock to drop suggest there is much more downside. To get right to the point, AT&T is losing users in every avenue from which it derives subscription revenue. This, in turn, hurts advertising revenue. DirecTV, the whopping $67 billion acquisition it made in 2015 in hopes of leveraging content to its mobile phone customers and become a multi-media company, continues to crush AT&T. Instead, it has become a huge albatross as it is hemorrhaging subscribers. Even worse, the new DirecTV is now losing subscribers after just two years of being in service. In Q4, DirecTV saw its total satellite subscribers fall 408,000 to 19.2 million. 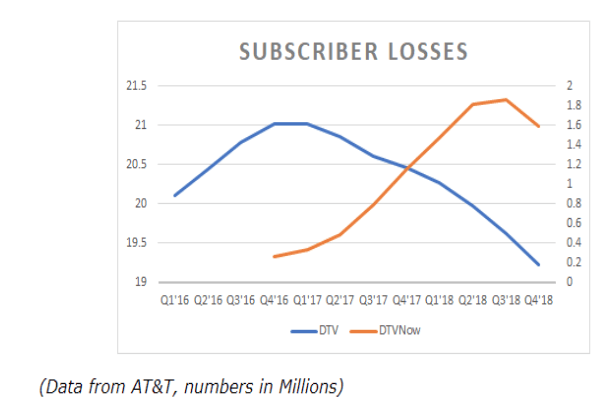 Additionally, DirecTV now lost 269,000 subscribers, a stunning 14% decline to 1.59 million from 1.86 million last quarter. DirecTV has now lost over 21 million, or some 9%, of its subs in just the past 18 months. Even worse, the Entertainment Group, which is where the DirecTV product lives, has seen its revenue decline 5.6% vs. last year, to $8.676 billion. Possibly, the most stunning were the numbers regarding HBO, its supposed crown jewel and the tool it is supposed to use to fight off the likes of Netflix (NFLX) and Amazon (AMZN). HBO saw its revenue fall to $1.67 billion from $1.68 billion. Most shocking was that HBO subscription revenue fell 3% to $1.4 billion in the quarter. Overall, the Warner cable division saw a 1.5% year over year decline. The loss of subs is only likely to accelerate as Disney (DIS) and other networks start withdraw their content from AT&T platforms as they roll out their own over-the-top (OTT) offerings. This doesn’t even address the mobile phone/wireless division. Competitors such as Verizon (VZ) and T-Mobile (TMUS) have stuck to focusing on offering the connections, and have been able to gain market shares through better service and lower prices. 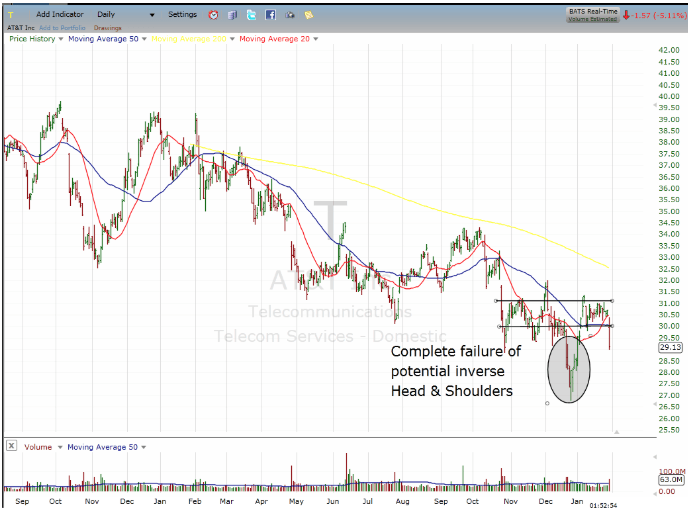 Lastly, value or Ma & Pa investors, that might own A&T as a safe play to collect the dividend, might be in a for a rude shock. The above-mentioned acquisitions have saddled AT&T with over $185 billion in debt. As cash flow slows, that dividend may be in jeopardy. Meaning, there is no level the stock has a valuation floor aka more downside ahead.